[X] supports reducing the size, scope and power of government at all levels and on all issues, and opposes increasing the size, scope or power of government at any level or for any purpose. Outlaw only fraud and force initiation. Tax only land rent and polluting/ congesting/ consuming the commons. Provide only network natural monopolies and protection of life and liberty. It's smaller by word count, byte count, and space on the page. However, I don't want the tarnished WSPP trophy, which could obviously be taken away by a determined contender. For now I'll just call this beta draft the World's Smallerest Political Platform (aka WSrPP), since that sounds better than The Three Geolibertarian Commandments. What you do or make is fully yours, but what you take or spoil is not. The tax reform that would best promote liberty, the environment, and prosperity is to tax bad things instead of good things. Labor, entrepreneurship, and wanted products are good things, yet these get taxed as though they were crimes that need to be punished. Pollution and congestion are bad things, yet these are in effect subsidized as though we wanted more of them. The forced redistribution of wealth from the poor to the rich is usually considered a bad thing, yet government makes this transfer with taxes and subsidies. Good products and activities are those that are voluntary, not just for the buyer and seller, but also for others who may be affected. Generally, production, trade, and consumption are good things, as they provide the goods that people want. Bad products and activities are those that are not voluntary, as they coercively harm others. The prime examples of bads are pollution and congestion. Economists call these “negative externalities,” since they impose costs on others. For example, each extra car on a crowded road slows down the traffic for the other cars. A free market maximizes social well being. Any tax on voluntary enterprise reduces social well being, but also, any subsidy reduces social welfare. In a pure free market, all economic activity is voluntary, and those who impose costs on others are obligated to compensate the victims. Taxes on wages, business profits, goods, and exchanges impose two types of costs on the parties. The first cost is the tax burden, the funds the taxed people have to pay to the government. This is a burden to the taxpayers, but it is not a cost to the economy, as the funds represent resources transferred from taxpayers to the recipients. The second cost is called the “excess burden” or “deadweight loss” caused by the tax. Suppose you are buying a car for $20,000 and there is a ten percent sales tax. The total cost is $22,000 and if you borrow the funds to pay with, you need to borrow an extra $2000, and pay interest on that extra amount. Those who would just barely be willing to buy the car at $20,000 will not do so at the higher cost, so the purchase and production of cars gets reduced. Even those who do pay the higher cost get less net benefit, as the difference from the most they are willing to pay and what they actually pay gets reduced, reducing their benefits from the goods. The excess burden is even worse than that for some products. For example, for goods such as books that have a global market, the seller can’t raise the price, and the tax eats into the profit, and in many cases, that type of enterprise ceases to function, and is replaced by one which can bear the tax but possibly creates less output and employs fewer workers. Any intervention in the market that drives out some enterprises will replace them with less-valued enterprises, since otherwise those replacements would have been there in the first place. Taxes on wages, business profits, buildings, and trade all have such a deadweight loss. The total deadweight loss from taxation in the U.S.A. has been estimated to be over ten percent of total income. This is a sheer waste of resources, and the loss is much greater over time, as the economy could have grown faster if not for this drag on productivity. Subsidies also have a deadweight loss, since the burden of the tax is greater than the benefits to those who are subsidized. That’s because the subsidy gets some people to buy products at a lower price, but the extra benefit these people get from those goods is less than if they had bought the products they would have gotten if not for the subsidy. For example, suppose the government subsidizes pizza so consumers only pay a dime per slice. More folks would buy the cheap pizzas, but the value to them of the last extra slices is less than the cost of production, so this is really a waste of resources. With both punitive taxes and the handout of subsidies, resources are not allocated to where they are most wanted by those who would cover the costs. The green tax shift would eliminate such excess burdens. It shifts public revenue to bad things and activities. When pollution crosses the owner’s property and enters the property of others, including people’s bodies, this is a trespass and a violation of others’ property rights. When there are only a few people or firms involved, they can negotiate a settlement, or the victim should be able to sue for damages. But when there are thousands, even millions, of people involved, lawsuits become impractical. In that case, an on-going pollution charge can compensate society for the damages. If the government levies the charge, it can take the form of a tax, but in substance, it is restitution and compensation for damages. In form, the pollution charge is a tax on a bad activity, committing aggression against others by polluting. Why not just prohibit the pollution? Because, the products have social benefits, which would be lost if the goods are not allowed to be produced. A pollution charge equal to the damages will reduce the output to the optimal amount, where the harm and benefit are balanced, along with compensating society for that pollution emitted. Regulations are less effective than pollution charges, because regulations do not let firms and individuals adjust their activities according to their own costs and benefits. With pollution levies, firms and individuals have the choice of reducing pollution or paying the charge, and they will do whichever of these is less costly. Pollution permits that can be bought and sold are more effective than regulations, but the gain from a higher permit price goes to the permit holder. The advantage of pollution taxes is that the revenue from these charges can be used to replace punitive taxes, those with deadweight losses. If pollution taxes raise $500 billion in government revenue, and are used to, say, reduce income taxes, and they replace regulations, there is a double dividend: a cleaner environment, and greater productivity. The same can be done with congestion. Tolls on crowded highways and streets, just high enough to let the traffic flow, put a charge on a bad activity, congestion, which eliminates it. Such tols can now be implemented with electronic devices that automatically record the charge without the car having to stop. Congestion tolls would replace taxes such as on gasoline. Gasoline is good - it makes our cars go. Transportation is a good thing, and as such should not be taxed. What is bad is the outputs - pollution and congestion, not the input, gasoline. Those who drive clean cars on uncongested roads do no harm and should not be taxed. Moreover, the efficiency of gasoline use should be nobody’s business except the buyer. Why is it my problem if you waste resources you paid for? It’s your problem. Cash subsidies to special interests such as farmers are obvious, but other subsidies are just as real and costly to society. Quotas that restrict imports raise the price of goods such as sugar, and are in effect a tax on consumers. The greatest subsidy of all is the implicit transfer of wealth from workers to landowners. When government provides public works and civic services - such as streets, transit, parks, security, fire protection, and schools - these increase the productivity and benefits of the locations served, and increase the demand to be located there. That generates higher rents and real estate values. If, as is usually the case, most of the funds come from taxes on wages, in effect worker tenants get double billed. A worker-tenant pays a higher rent because of the territorial services, and then he has to pay taxes to finance them. The landowners get subsidized by getting rent and land value paid for by the taxes on wages, goods, and business profits. Since landowners tend to be wealthier than renters, taxing wages to pay for civic goods amounts to a forced redistribution of wealth from the poor to the rich. Subsidies are bads, so a tax on land value or land rent is a tax on a bad. In substance, it is a payment for services that generate rent and land value. Unlike taxes on production, a tax on land value has no deadweight loss, since the land will not flee, shrink, or hide when taxed. If a landlord was already charging the market rent, a higher tax on land will not be passed onto the tenant, since that would create vacancies. The supply of land area is fixed, and land has no cost of production, so the rent is a pure surplus that can be tapped for public revenue with no ill effect. It can even have a beneficial effect if lazy landowners were not putting their land to its most productive use, since the land-value tax is based on the highest and best use of the land as determined by the market prices of the neighborhood. After the tax is in place, a new land owner would have no tax burden, since the price of land would fall, and what the owner pays in the land tax, he saves in not having to pay mortgage interest. Of course the same effect can take place if public works and civic services are privatized, as they are with condominiums, homeowner associations, and proprietary communities such as apartments and shopping centers. Members of condominiums pay a monthly assessment based on their membership and property rather than on their income or purchase of goods. A complete green-tax shift would abolish taxes on wages, interest, dividends, transactions, and buildings, and replace these with charges for pollution, tolls on congested roads and streets, and the public collection of land rent. The pollution levy would also replace regulations and pollution permits. The economy would prosper from the elimination of the deadweight losses from both taxation and regulation. Advocates of free markets should enthusiastically support the green tax shift, as this enhances liberty along with greater prosperity. There would be no more intrusive tax audits and no snooping into private financial affairs. There would be no tax evasion, since land cannot hide, and pollution levies are based on measured pollution. The penalty for refusal to pay the levy would be a loss of property, not prison. Entrepreneurship would be completely unshackled, and market prices and profits would no longer be distorted by taxes and subsidies, since levies on pollution and land value make users pay for the costs of their production and consumption. Even if human activity is not contributing to global warming, the green tax shift is good for liberty and the economy. If pollution is causing climate change, then the reduction of harmful global warming would be a bonus. 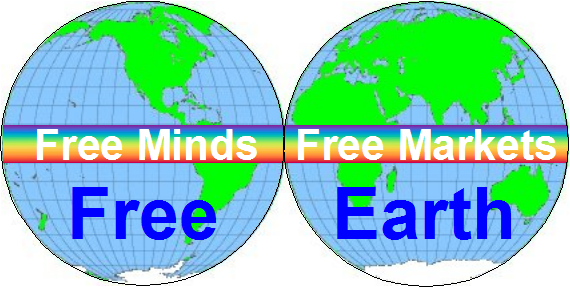 Freedom is green, and the best environmental policy is a pure free market, since an inefficient use of resources needlessly destroys the environment. The promotion of a green tax shift would put the free market movement at the vanguard of the environmental and move it away form its current propensity to favor market-hampering regulation. With the green tax shift, environmentalists and free-marketeers will find common ground. Dr. Fred Foldvary teaches economics at Santa Clara University and is the author of several books including The Soul of Liberty, Public Goods and Private Communities, and the Dictionary of Free-Market Economics. I still think the odds for the LP nomination are Kubby 35% Phillies 25% Root 25% Smith 5%, with the remaining 10% for the chance that Ron Paul would stoop to re-run his 1988 LP race. The Libertarian Reform Caucus doesn't endorse internal candidates, but here is my personal reformer take on them. With his made-for-TV brand of moderate libertarianism, Root is likely to get the most reformer votes in Denver. However, I caution against tying the reform cause to his candidacy, which has initially seemed more about Wayne Root than about libertarianism or the LP. I don't know of any interest shown by Root so far in the holy trinity of reformer issues: Platform, Pledge, and Purpose. Aside from Ron Paul, Root would probably have the most appeal among voters generally and LP members particularly, but his support among NatCon delegates (who will vote on the trinity) will be disproportionately lower. I'm going to support whatever candidate is best equipped to enduringly expand the varieties of principled libertarianism that the LP officially tolerates, and Root doesn't seem interested in being that candidate. Like Root, Phillies has apparently decided not to sign the Restore04 petition to rescuscitate the extremist and verbose 2004 Platform, which Phillies aptly calls "abysmally repetitive". Phillies' commitment to LP activism is unquestionable -- head and shoulders above the rest of the field. On substance, Phillies has shown an open mind about deviating from the extremism of the pre-Portland Platform, and has been attacked for it by the self-described radical Kubby campaign. All of this would make Phillies my default choice, except that I'm disturbed by his tendency to personally attack libertarians who disagree with him on policy and (especially) on LP administration. He viciously criticized Ron Paul as a "homophobic bigot" for his policy stand on defederalizing gay rights, well before the recent revelations about old Ron Paul newsletters (ghost-written by Lew Rockwell?). He also has joined anti-reform conspiracy theorist Christine Smith in calling for a complete purge of the reform-friendly LNC because of how it has responded to the overwhelming support for Ron Paul among the LP rank and file. George has a history as a hard-working and unflinching gadfly and investigator of the alleged scandals in recent LP history, and so it's not clear he has the personality or inclination to unite a Big Tent LP. However, in the unlikely event of the Ron Paul campaign completely discrediting itself in the libertarian movement, George will be well-positioned to say "I told you so". Steve Kubby was the 5th signer of the Restore04 petition, and he and his communications director Tom Knapp position Kubby as the most authentically radical candidate. Kubby disparages what he calls efforts to water down the Platform, and claims to be a "plumbline" (i.e. Rothbardian) radical. However, he is an ardent supporter of Ron Paul despite Paul's many heresies against Rothbardianism, and echoes Paul's reverance for the Constitution (which should be reviled by any good Rothbardian anarchist). Indeed, on Steve's webradio show I recently got him to admit that for him, the Constitution trumps zero-aggression absolutism, and that is why he supports the Sixth Amendment right of the accused to compel innocent third parties via subpoena. Kubby seems much more willing than Phillies or Smith to give fellow libertarians the benefit of the doubt for the sincerity of their libertarianism, and George would do well to adopt some of that open-mindedness. Among these top-tier candidates, Christine Smith is by far the most willing to pander to LP radicals. Not to be out-radical'd, the Kubby campaign attacked Smith for coming to her radicalism only lately. Smith routinely says the LP has been "infiltrated" by people who care more about their own power than about America's liberty -- which if true would be good news to reformers who wish the LP had any power to be grabbed in the first place. Smith says she is a fan of Ron Paul and the Constitution, but opposes all taxation and says the constitutional functions of government could be funded by voluntary contributions. None of these candidates have had anything explicit to say so far about the Pure Principles Platform that is emerging from the Platform Committee. Each candidate has weaknesses, and only one seems to want to disqualify herself from potential support by reformers. The good news is that all of these candidates implicitly reject anarchism and explicitly endorse the idea of limited constitutional government, even if they are vague about how that government would finance itself or maintain its monopoly on force without ever initiating it. Platform Committee Chair Alicia Mattson has sent an email out through official LP channels asking party members to take a survey about the purpose and scope of the Platform. Presumably to avoid having to get a majority of PlatCom to agree to its content, she apparently (and perhaps wisely) did not seek input from any other PlatCom members. Here are the substantive questions, along with my answers and predictions about results. 1. Platforms serve both internal and external purposes. &Which of the following more closely represents your opinion about what should be the principal purpose of our party platform? a) Our platform should be more of an externally-focused document to market our party to voters. b) Our platform should be more of an internally-focused document to guide our candidates. I voted (b), even though it's apparently designed to be the radical choice. Our platform should be a statement of our common principles. It should guide our candidates and marketers, not replace them or dictate to them. I bet about 60% of NatCon delegates would vote (a). 2. Our platform will be read by those who are familiar with our ideas and those who are not. Who do you believe should be our principal target? a) We should target individuals unfamiliar with (or even opposed to) our ideas so we can educate them on the merits of libertarianism. b) We should target individuals already sympathetic with our ideas to convince them to vote for our candidates. I think I voted (a). I don't like either choice. Our principle target should be anyone who wonders what the LP stands for. (a) might get more votes, but it will be close as I doubt many will love either choice. 3. Shorter documents are more likely to be read, while longer documents are more likely to be comprehensive. If you had to select only one, which one of the following more closely represents your opinion about the optimal length of our platform? a) A short platform covering fewer issues. b) A long platform covering more issues. I voted for the radical (b) choice, even though what I prefer is a short platform covering more issues. This clearly shows that Alicia was not trying to rig the quiz to favor the short Pure Principles draft that PlatCom is moving toward. (a) will probably get more votes. 4. Our platform uses a combination of negative and positive phrasing, i.e. what we oppose and what we champion. Which of the following more closely represents your opinion as to the language phrasing that should be used mostly in our platform? a) We should emphasize what we oppose in government and the harm it causes. b) We should emphasize what we favor in a free society and the benefits this brings. Another blatantly non-rigged question. I reluctantly voted for the less-radical (b), even though I oppose filling the Platform with marketing fluff that vouches for the benefits of our principles. (b) will win handily, but the result won't support our Pure Principles draft as much as another question might have. 5. We know that libertarianism is both morally right and improves the lives of the greatest number of people. &Which of the following more closely represents your opinion as to the language phrasing that should be used mostly in our platform? a) We should emphasize the moral justification for our views. b) We should emphasize the utilitarian benefits of our positions to the reader. Yet another non-rigged question! I reluctantly voted for the radical (a) choice, but the Pure Principles draft eschews both philosophical justifications and utilitarian vouching. (b) should edge (a). 6. Some people believe our existing platform language can be repaired through a series of amendments. Others believe that we need to delete the old language and start anew. Which of the following more closely represents your opinion about how to better fix our platform? a) We should amend the existing language. b) We should delete the old planks and start from a clean slate. I voted for (b), which should get a majority, but some will interpret this as support for writing a marketing brochure instead of adopting the Pure Principles draft. Sigh. 7. Which of the following more closely represents your opinion about how we should address controversial issues where there is not the bylaws-required 2/3 support among our delegates to state one position or another in our platform? a) The platform should be silent on such issues, only emphasizing areas of internal party agreement. b) To generate 2/3 support and avoid being silent on such issues, compromise language for the platform should be crafted that acknowledges there is more than one acceptable position. Radicals will not like either choice, but I don't have a clear favorite. I voted for (b), but my preference is to state the core of agreement whenever possible -- which includes pretty much every issue except abortion, the death penalty, and some miscellaneous ones like intellectual property. (a) will probably win. 8. Which of the following more closely represents your opinion about how much implementation detail should be included in our platform planks? a) We should include very little to no implementation detail. State only the general principles and leave it to our candidates to address how to implement them. b) We should provide comprehensive details on how to implement each plank. Finally, a question that can help the Pure Principles draft. :-) I voted for (a), which will win convincingly. 9. Some topics are included in a platform because they satisfy an internal party constituency. Some topics are included in a platform because they will appeal to voters. Which of the following more closely represents your opinion about the types of topics that should be emphasized in the platform? a) We should emphasize topics that are appealing to voters. b) We should emphasize topics that appeal to internal party constituencies. I reluctantly voted for the radical (b), because I oppose the brochure intent underlying (a) -- which will win due to the phrasing. 10. Which of the following more closely represents your opinion as to how far-reaching plank language should be? a) We should be destination oriented, describing how we want society to ultimately appear. b) We should be directionally oriented, emphasizing what Libertarian officeholders can reasonably achieve over the next few years. I reluctantly voted for (b), even though I oppose the "next few years" part. The idea of the Pure Principles draft is "timeless directional principles", emphasizing neither destination nor near-term transition. (b) will eke out a majority, and this will be yet another part of the quiz that rekindles the hopes of exuberant moderates who think that in Denver we can pass a Platform written as a brochure or a Contract With America. We can't, and we shouldn't try. 11. 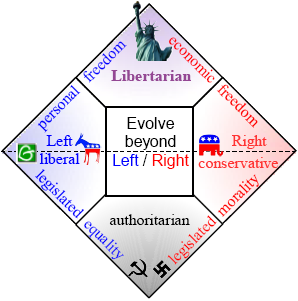 Which of the following more closely represents your opinion as to how we should handle subjects for which mainstream Libertarian thought is at odds with what most voters want? a) We should be silent on those issues. b) We should state our positions on those issues. I reluctantly voted for the more radical (b), only because of the qualifier "mainstream". This vote will be close.